Present-day bathrooms in general households are small. If you want to have some privacy when taking a shower and at the same time keep the bathroom airy and dry, installing shower curtains is quite a good option. Here are some simple tips for choosing and installing shower curtains. In general, shower curtain is made of materials like plastic or nylon, which is waterproof and windproof to a certain extent. Shower curtain is mainly used to contain the spray from a shower and keep the bathroom warm. In most households, electric water heaters and washing machines are installed in the bathroom. It is therefore important that the shower curtain is fire-proof even though bathrooms may not be susceptible to fire. NFPA 701 published by The American Fire Association is one of the fire standards more commonly used for testing the flame propagation capability of fabrics and films. Due to the wet weather in Hong Kong, shower curtains made of polyester will be more suitable for general home use in Hong Kong. 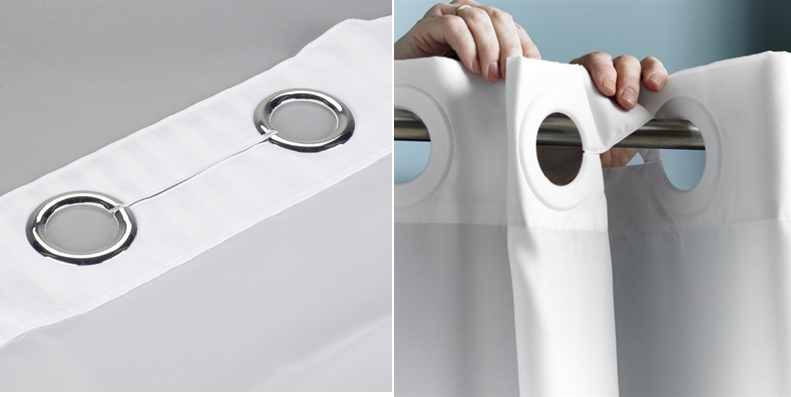 Shower curtain made of polyester is not only water resistant; it is easy to wash and dry. It is resistant to mildew. Some shower curtains have even undergone anti-bacterial treatment to ease users’ minds. Lightweight and thin shower curtain is recommendable as materials that are too thick may affect its waterproof function and breathability, thus easily becoming moldy after prolonged use. A thinner shower curtain that is able to drape well can be regarded as a good one. The thickness of a shower curtain usually ranges from 0.1 mm to 0.15 mm. For simple comparison, if shower curtains are the same size and made of the same materials, the heavier will certainly be the thicker. It is recommended to choose a shower curtain that is wider than the shower or bathtub, i.e. the width of the area where a shower curtain is used shall be larger than the actual width of the shower or tub, so as to prevent water from spraying out all over the bathroom. The height of a shower curtain usually ranges from 180 cm to 200 cm. It is advisable to hang the shower curtain slightly above floor level, as it will easily get dirty when stepping on it or cause falls if it is too long. The smell of a shower curtain is related to the printing process. Do not worry if there is a smell of ink after you unwrap the packaging. Simply hang it in a place with good ventilation and the smell will fade away naturally. Shower curtains should be cleaned regularly to prevent mildew or remaining of skin residues. If you find shower curtain hanging on hooks quite cumbersome, you may choose hanging curtains without hooks which make the bathroom look even more fashionable. The curtain hangs on the rail easily by slightly bending the curtain head. There is also no worry about wear and tear.